This photo combines the Mardi Gras half-face mask shown in a prior post with the tri-colored bow tie covered in this post and a party hat and jester’s cap I will be covering in a future post. Punch art items are hand-punched and trimmed each so each will be unique but that adds the character I look for in a handmade project. If I wanted perfect and the same card everyone else gives I’d buy one at the store!!! Punch one bow tie from plain cardstock to use as a base. If desired u can make two tri-colored bow ties at once. Punch one tie in purple and green (all metallic or all plain). Punch one bow knot from gold and three from the plain cardstock for each tie you are making. You can, of course, do the ties and bow knot in any of the three colors you like. Stack the three bow ties and cut them in half. Glue the two halves to the tie base. Then prepare the bow knot. I like to glue several of the knots together to create a little dimension. After these dry glue the gold punch to the stack. When it dries glue it in the middle of the bow tie. 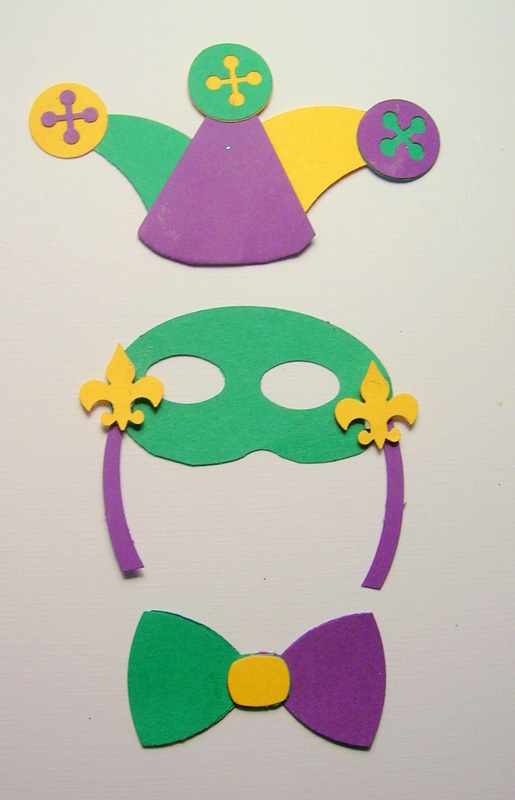 One more step and the you will be ready to make your very own Mardi Gras card!